Rhein in Flammen are spectacular firework events held on the Rhine River at Bonn, St Goar, Koblenz, Rüdesheim and Oberwesel. Boat tickets sell out fast. Rhine in Flames at St Goar / St Goarhausen Photo: Touristikgemeinschaft Loreley-Burgenstraße e.V. Each summer, massive firework displays light up the Rhine River in Germany. 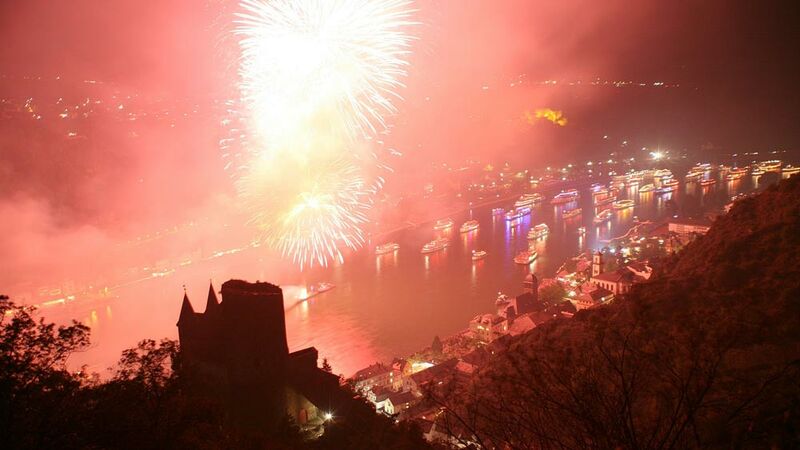 These events known as Rhein in Flammen (literally, Rhine in Flames) are held on five summer weekends at five different locations along the Rhine near Bonn, Rüdesheim, Koblenz, Oberwesel, and St Goar. Further firework displays are held in other towns including major events in Frankfurt am Main, Cologne and Düsseldorf. Visitors can enjoy the fireworks from many riverbanks and hills overlooking the Rhine River, but the best views are from the around 70 Rhine River pleasure cruise boats that congregate at these fireworks displays. Early reservations are essential for seats on these riverboats – tickets are not cheap but usually include meals as well. Fireworks along the Rhine River have a tradition going back around two centuries, although the major extravaganzas are a more recent invention. To distinguish the special firework events from lesser shows that try to trade on the famous name, the five largest firework displays have been christened Rhine in Flames – The Original (Rhein in Flammen – Das Original). Each festival has its own hours and special accompanying events. As it stays light until relatively late in Germany during summer, the fireworks seldom start before 9 pm and generally last around an hour. The Rhine in Flames spectaculars can be seen from many vantage points along the Rhine River. Most public spaces on the riverbanks and in the hills are free but as the firework displays are often spread out along the Rhine the show is best seen from the deck of a riverboat. Around 70 Rhine River pleasure boats congregate at each Rhein in Flammen event. These boats cruise down the Rhine and follow the different firework displays and lit castles. Tickets for the Rhine in Flames boat cruises are generally not cheap but still sell out very fast. Advance reservations are generally required. Most boat cruises include meals while drinks are always available. Regular discounts are not applicable on Rhine in Flames cruises. Special excursions may be available on boats, e.g. from Frankfurt, that usually do not cruise on certain routes on the day of the fireworks and the next day as boats reposition for and after the event. The Rhein in Flammen spectaculars are very popular with tourist and locals alike. Many towns along the route arrange festivals and special cultural programs on the weekend of the fireworks. The banks of the German Rhine River are home to several important winegrowing areas and many of the small towns have viniculture, in addition to tourism, as the base of their economies. The wine festival in Oberwesel is particularly famous while wine always seems to flow rather freely in Rüdesheim. Many other towns will have “wine streets” and other street festivals where local food and drink can be consumed. Although not part of the official Rhine in Flames schedule, major firework displays in Frankfurt am Main, Mainz and Düsseldorf also attract large crowds and many boats. These firework displays are held in conjunction with large folk festivals in these two cities. In Düsseldorf, the Kirmesfeuerwerk is held mid-July and the Japanese fireworks on the third weekend of May. In Frankfurt am Main, two special firework events are held at the beginning of August (Mainuferfest) and end of August (Museumsuferfest). In Mainz, a new event is the Summer Lights (Mainzer Sommerlichter) on the last Saturday of July. These firework displays are spectacular but not as special as the Rhein in Flammen events. However, transportation is easy and the views from the riverbanks and many buildings in these cities are mostly free. Public transportation is generally the best choice for traveling to the Rhine in Flames spectacles. Extra late trains are often available on the night of the event with additional passenger and car ferries crossing the Rhine too. See train and public transportation schedules at German Railways. With the possible exception of the Rhein in Flammen in Bonn, drivers will have to deal with narrow roads in the Rhine Valley and limited parking opportunities in small towns. However, even for the Bonn event, public transportation is generally the better option as the fireworks draw many visitors from nearby Cologne and the Ruhr area. The spectacle in Rüdesheim is similarly popular with visitors from nearby Mainz, Wiesbaden, and Frankfurt am Main. Day pleasure cruises on the Rhine River in Germany are very popular. With the exception of special events such as the Rhine in Flames weekends, reservations are generally not possible or required for day-trip sightseeing excursion cruises. The most popular area for day cruises is the Middle Rhine between Rüdesheim and Koblenz – this area is littered with castles and top sights include the the famous Loreley. Day-trip and panorama cruises are also possible in the Cologne and Bonn areas.